How much luckier can one get? Channel Classics and the world's best Super Audio engineer offered me the golden opportunity to. For the first time, put all these wonderful songs on record in SACD format! Even better, I have been joined by Reinild Mees, Holland's most recognized pianist and coach, who added a sublime touch to every song I sang. The songs on this album include some of the most beloved classical poems from the Tang and Song dynasties [I would include the relative dates after each dynasty] as well as the most popular folk songs, which, because of their beauty and renown in China, are today considered to be of high artistic quality. For the benefit of non-Chinese speakers, I have personally translated these songs into singable English. Additionally, there are four more songs sung in English included as bonus tracks; I believe it is the first time these songs have ever been recorded. One more reason for my decision to make a singable translation is that the Chinese government is now hosting biennial international vocal competitions in Beijing, and some of the songs--such as "My Sentiment to the Yangzi River," "Emei Mountain Air", and possibly "Mayeela"--are required singing for participants in the competition. I am proud that we have such striking poems and expressive language. Moreover, I'm pleased to have the opportunity to let the world hear these Chinese songs from an intellectual perspective rather than from the accustomed primitive and naive aspects of Chinese musical traditions. We have many other excellent songs apart from "Mo-li-hua". [Just for the record, I don't understand what he means in this sentence--you may want to cut it, or further explain it] I've borrowed the German word "Lieder" in order to emphasize the complex artistic elements of these songs. 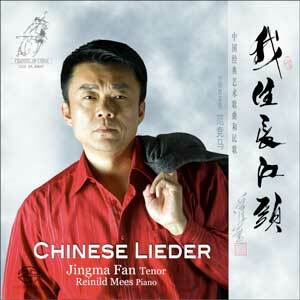 I must say, the biggest--and most exciting--challenge in singing these "Chinese Lieders" has not been to "show-off" my trained operatic voice but to retain the original style and simplicity of the songs. Listeners already familiar with my voice might be surprised with the results, but believe me, it's an adaptation well worth making for the sake of this music.